It's truly a wonderful day. The birds are singing. The sun is shining (well, the day before at least). And Rich Guy is arriving into YVR! Yes, that only means one thing - more eats! Gone for what has seem like an eternity, I had lost one of my "go-to" dining companions. Anxiously, I awaited his return. Naturally, I offered to pick him up from the airport. Scheduled to arrive at 4:00pm, it looked good that we could catch some dinner in the land of eternal traffic. Unfortunately, his flight arrived early and that ultimately kiboshed our dinner plans in Richmond. No matter, we made it to my house first and I gathered up the entire family to go out to eat. Besides, Rich Guy was treating! LOL. Since we had to give him a lift home to Coquitlam, we decided to eat in Port Moody. Trying to stay away from heavy eats after sitting on a plane for 15+ hours, we settled on Japanese. Located in Newport Village, Nagano has a reputation for good eats; yet at relatively high prices. Once again, Rich Guy was treating, so that was perfect! LOL... One look at the menu and indeed the prices are a bit scary... $9.00 for an udon... That kinda says it all. But then again, we have an open mind and prefer to let the food do the talking. After we put in our order, we were given free head. Er, no wonder the everything is so expensive! ROFL! Okay, what I mean is we got a complimentary BBQ Salmon Head. Hey, not much to complain about since it was free. Mind you, it was pretty good too. 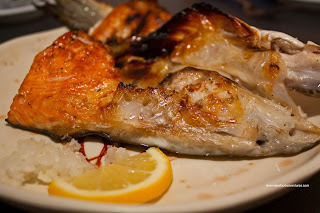 The attached meat was moist and the rest of the parts were what you expect from a fish head. 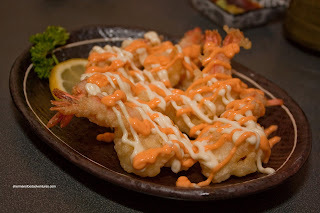 Fate would have it, the Ebi Mayo arrived after the head. Doused with an obscene amount of mayo, this was almost ironic after the head... Whatever the case, this has been one of the better versions outside of an Izakaya. 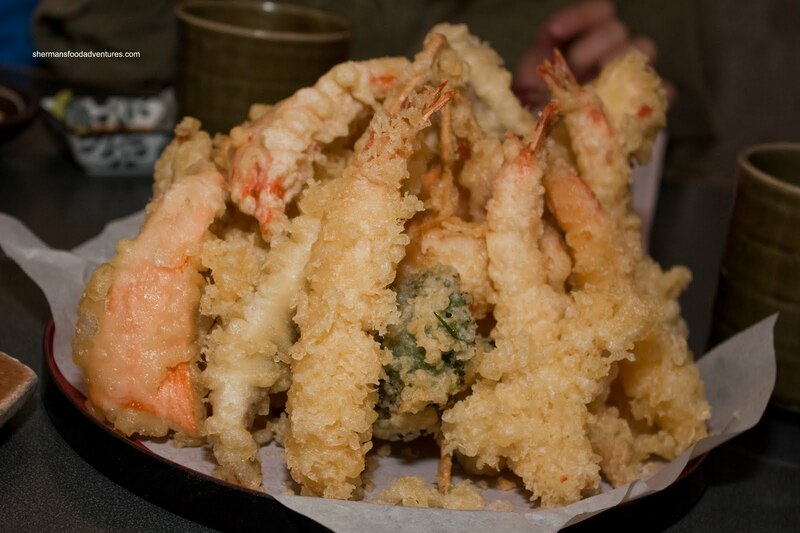 The shrimp had the requisite snap texture while the light tempura was crisp. Despite the appearance of too much mayo, it was the right amount. 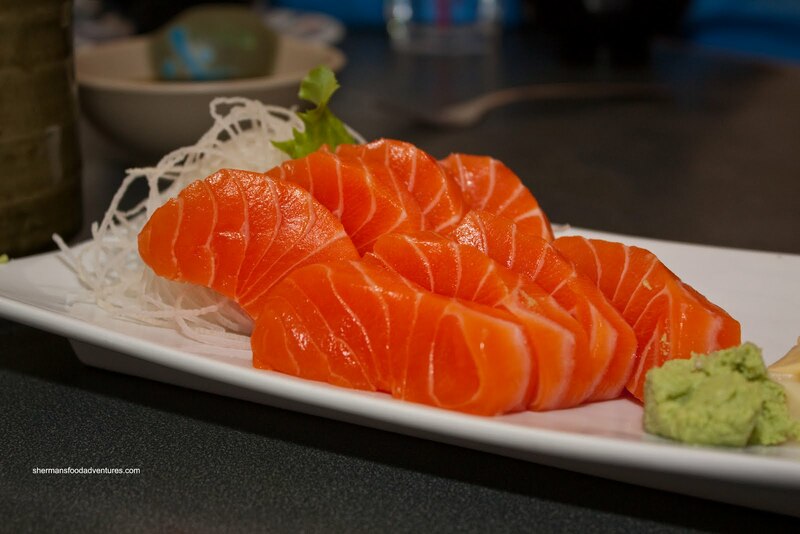 Next up was the Salmon Sashimi and it was good. As you can see, it sure looked fresh. Nice colour and texture. We could actually taste a difference. The flesh was quite sweet. 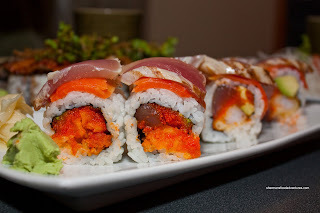 We decided to try 2 of their specialty rolls starting with the Moody Fever. Now if someone wasn't familiar with the fact they were in Port Moody, the name of this roll could elicit some strange thoughts. This could be one "emo" roll... So the actual roll was comprised of a prawn tempura roll with tobiko, tuna and avocado topped with smoked salmon and seared tuna. Despite its modest size, the roll was substantial. If you look closely, what amounts to an entire order of tuna tataki rests on top of the roll. I took a sample of the sushi rice and it was more than acceptable. Slightly on the drier side, it was chewy and had some flavour. 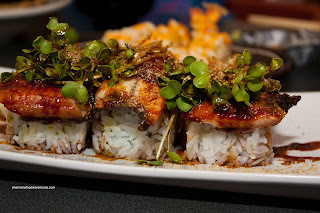 The next specialty roll was the Dancing Unagi. First we had a roll that had emotional issues, now the second one is a dancing eel. Not sure what they are smokin' here... But I can see why they call it as such. The large pieces of unagi almost appear to be "dancing" atop a real crab California roll. The whole thing is finished with radish sprouts and unagi sauce. Despite sounding good on paper, I'm not sure if it is necessary to have real crab in this roll, it gets completely lost. With that being said, the roll is a fantastic value since there was enough unagi to make several rolls over. If we thought this roll was big on the unagi, it didn't prepare us for the Deluxe Assorted Tempura. The darn thing was so large, I had a hard time figuring out how to take a picture of it. Look at it! It was a mound of prawn, fish, squid, yam, sweet potato and squash tempura. Although the batter was on the thicker side of the ledger, it was cooked all the way through and wasn't heavy. 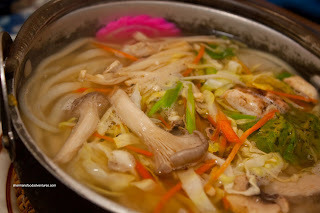 Since the kiddies were with us, here is the requisite Chicken Udon. Although the udon was good in its own ways, I personally do not like it cluttered with so much stuff. Look at it, you can barely make out the udon from the myriad of veggies. Then again, I can't knock it too much since the noodles were still chewy and the soup was quite tasty, albeit not tasting like most other udon I've had. 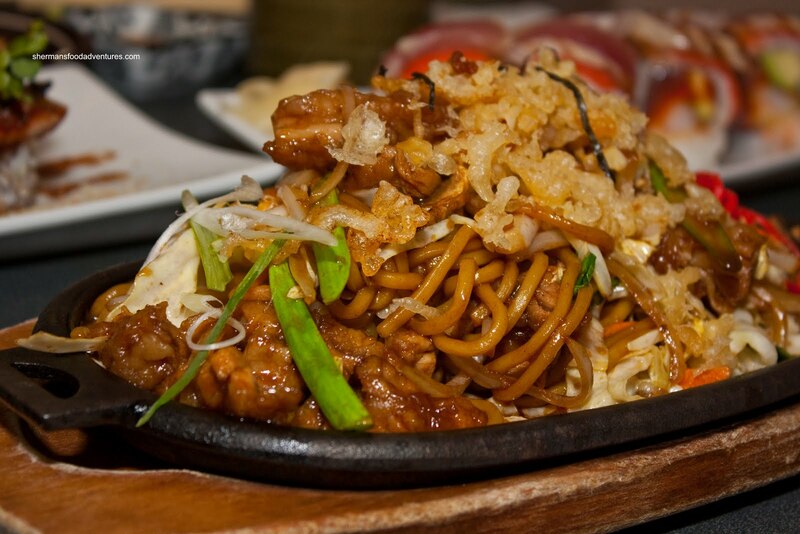 For our last dish, we ended up getting the Chicken Yakisoba as a "filler" of sorts. Little did we know that their portions are quite large. We actually didn't end up eating this dish at all since we were quite full. Of course I had to take a sample still! From what I tried, it was quite good. The noodles were chewy and it was delicious. A nice balance of savoury and sweet. Lots of chicken and other goodies mixed in with the noodles too. Rich Guy had it for lunch the next day and remarked how good it was. You know what? 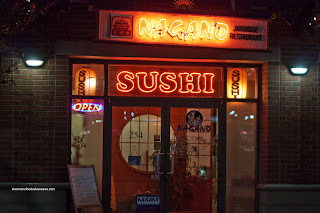 I have been somewhat avoiding Nagano for awhile because I have seen the prices. 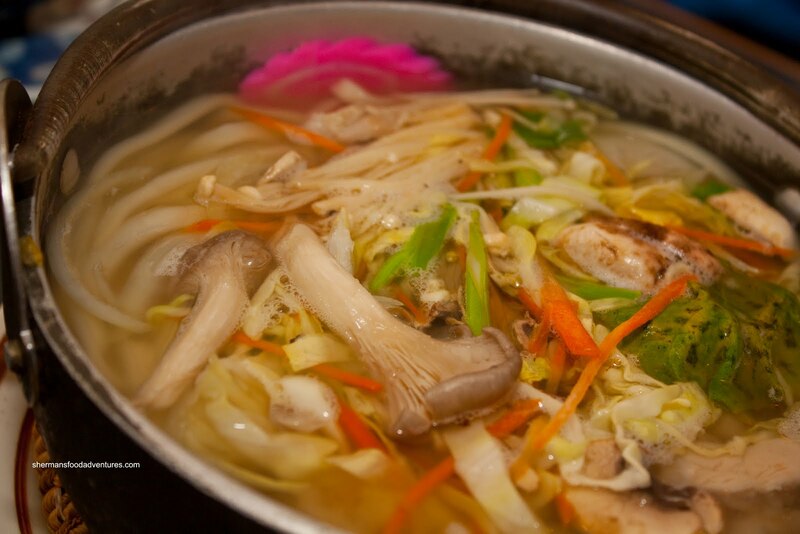 Compared to many of the nearby Japanese restaurants, Nagano can be deemed expensive. However, after this visit, the portion-to-price ratio appears to be quite fair. In that respect, it offsets the prices. We thought most of the food was fresh and well-made. Compared to nearby Sango, Nagano provides a better bang-for-the-buck at roughly the same prices. Furthermore, Nagano has the slight edge in terms of service as well. A solid experience all-around.